MicroRNAs (miRNAs), as a major player in post-transcriptional regulation of gene expression, have been reported to regulate a broad variety of key biological processes, including growth, development and stress responses in both plants and animals. While the biogenesis and regulatory abilities of miRNAs have been extensively studied, the evolutionary history of miRNAs still needs more exploration. So far, several models explain the origination of plant and animal MIRNA (MIR) genes. Both inter-species and intra-species conservation and divergence of miRNAs exhibits functional adaptation to changing environments in evolution. Here we summarize recent progress in how these similarities and differences contribute to the characteristic features of miRNA evolution in the two kingdoms. Keywords: microRNA, origination, evolution, biogenesis, C. elegans, cytoplasm. Keywords:microRNA, origination, evolution, biogenesis, C. elegans, cytoplasm. Abstract:MicroRNAs (miRNAs), as a major player in post-transcriptional regulation of gene expression, have been reported to regulate a broad variety of key biological processes, including growth, development and stress responses in both plants and animals. While the biogenesis and regulatory abilities of miRNAs have been extensively studied, the evolutionary history of miRNAs still needs more exploration. 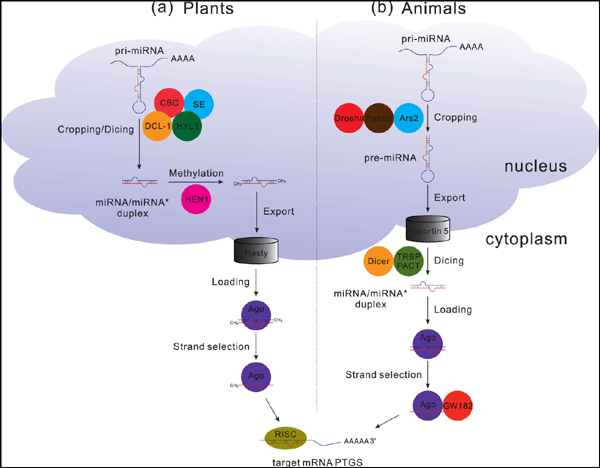 So far, several models explain the origination of plant and animal MIRNA (MIR) genes. Both inter-species and intra-species conservation and divergence of miRNAs exhibits functional adaptation to changing environments in evolution. Here we summarize recent progress in how these similarities and differences contribute to the characteristic features of miRNA evolution in the two kingdoms.